The market is one institution that has never lost its popularity and has thus proved a good source of revenue for the town. This postcard from 1908 has many interesting features, not least the pleasantly-designed gas lamp in the foreground which would now form a collector’s item. The cattle pens were once filled with beasts brought across on the Irish boats. 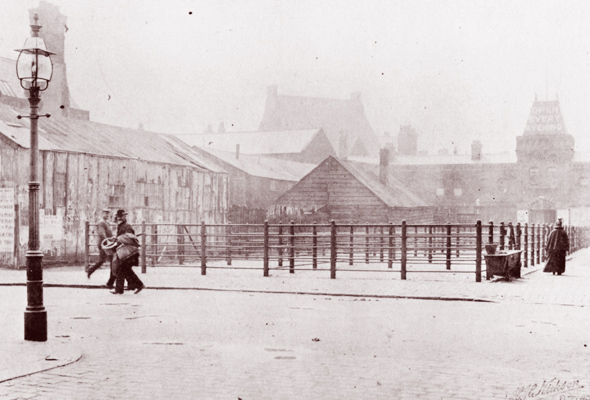 These have gone, as have the old wooden buildings, which were replaced with a market hall built of Longridge stone. The Whitworth Institute, with steep pitched roof and tall chimneys at its gable ends, became the Fielden Free Library. ‘Open every evening’ refers to the Queen’s Theatre, which billed the celebrities of the day and where lectures and sometimes meetings were held. Land and market rights were eventually sold to the town for £6,750 in 1889, the Commissioners driving a hard bargain, for £500 of that for slaughterhouses. My grandad and grannie lived just behind the Queens theatre in Adelaide Court, I used to go there as a very young child. My gran used to wait to go to the market until around tea-time because the vegetables and chickens were a lot cheaper at thest time., their name was Mary and Charles Askey.